Kerala is the most fascinating destination in India. A tour to this paradise [popularly known as GOD’S OWN COUNTRY] is must for every tourist coming to India. Usually Kerala tour packages cover all the famous places of Kerala. The Backwaters of Kerala is unique and is found nowhere else in the world. Backwaters are a network of lakes, canals and estuaries and deltas of forty-four rivers that drain into the Arabian Sea. 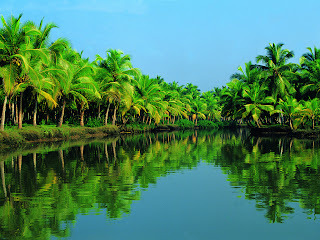 The backwaters of Kerala are a self supporting eco-system teeming with life. The canals connect the villages together and are still used for local transport. Over 900 km of this labyrinthine water world is navigable. Kumarakom and Alleppey (new name Alappuzha) are the prominent Backwater tourist attractions in Kerala. The most exciting aspect of Kuttanadu is the Kettuvallam (traditional Houseboat) which has become the most popular tourism product in India today. In a land as water bound as Kerala it wouldn't be an unusual sight, but for a visitor to God's Own Country a houseboat gliding along the vast green expanse of the backwaters is the most amazing spectacle in the world. Even more enchanting is a holiday in the houseboats of Kerala. The Kettuvallam (traditional Houseboats) are a raving attraction for tourists as these houseboats take you to remote and absolutely stunning and picturesque spots located in the interiors of Kerala, South India. they provide sheer verdant green surrounding and exceptional natural beauty. Honeymoon house boats offer flowered bed, candle light dinner and honeymoon cake to honeymoon couples. You will go on a full day city tour of Cochin. With its wealth of historical associations and its magnificent setting on a cluster of islands and narrow peninsulas, Cochin is one of the most fascinating cities of coastal South India. It is a city with indelible marks of Christianity, Islam, Hinduism and Jewish traditions. Of special mention is the older parts of the Fort Cochin area. It more or less exists as it used to be a thousand years ago. This part of the city reflects an unusual blend of medieval Portuguese, Dutch and English country life grafted on to the tropical Malabar Coast. The 16th century Mattancherry Palace, also known as the Dutch Palace, is a fascinating fort with elegant buildings and interesting collections from the Royal traditions of the region. The unique feature of Cochin is the unexpected and isolated Jewish community, whose origins date back to AD 52. They are self-contained and have their own synagogue. The area around the synagogue, known as 'Jew Town' is one of the main centers of spice trade. Scores of small firms huddle together in old dilapidated buildings and the air is filled with the aroma of ginger, cardamom, cumin, turmeric and cloves. Cochin has an interesting fishing community, where they still use ancient cantilevered fishing nets called Chinese fishing nets. The nets are fixed to long bamboo poles on the shore. When fishing, the poles with the nets are lowered by a primitive fulcrum mechanism. Then the pole and nets are lifted along with the catch. In the evening, you will watch the Kathakali dance show. A special treat awaits us in the strength and vigor of the Kathakali dance drama as it enacts episodes from great Indian epics. The extremely stylized gestures, the elaborate make-up, the masks and the splendid costumes of these all-male dancers recreate an incomparable sense of pageantry. In the morning, we drive to Periyar and the cool, misty Cardamom Hills. This is a magnificently scenic region 4000 feet and higher, with forests and valleys, roaring streams and pristine jungles. We will visit Periyar Wildlife Sanctuary, one of India's first Project Tiger Reserves and an excellent place to view elephants and many other animals. In the afternoon, we will go on a spice plantation tour with guide. In the morning, we will go on a guided jungle walk in Periyar National Park. You will have the afternoon to spend on your own. In the morning we drive to Alleppey for an overnight backwater cruise on a houseboat. The houseboat provides all comforts - beds, a kitchen, western toilets and an upper deck. Traditional lanterns are used as lights. The cuisine is of traditional Kerala flavour along with the local specialties. You will spend the day cruising on the boat through remote tribal villages along the tranquil backwaters of Kerala. Sensational in its own silent way, the cruise takes you along snake boat docks, friendly cheering villagers, coir (jute) making communities, toddy (local spirit) shops, fishing nets pitched for the day's catch, bunded paddy fields and manual canoes of different sizes crisscrossing each other. The experience enables you to reach beautiful untouched areas. After breakfast, we disembark at Kumarakom and drive to Kovalam. Here, you will have some free time to go to the beach or enjoy an ayurvedic treatment. You will have the entire day to spend at the beach or to enjoy ayurvedic treatments. You will be taken to Trivandrum airport for your flight. CALL NOW : FOR THE BEST and CHEAPEST rate !